Optical effects are the result of tiny particles in the atmosphere. During its passage through the atmosphere, sunlight is reflected, refracted, and scattered by water droplets, ice crystals and dust particles. Sunlight or visible light consists of a spectrum of colours: red, orange, yellow, green, blue, indigo, and violet. Rainbows result from an optical illusion caused by millions of water droplets acting like tiny prisms. Each component colour of visible light travels at a different rate in the water droplets, and refracts (bends) at different angles. The water droplets split sunlight into the seven colour components and reflect them to the viewer’s eye. A rainbow appears as an arch stretching to the sky, as the water droplets lie above the observer’s level of sight. From a high viewpoint such as an aircraft, it is possible to see a complete circular rainbow formed by raindrops both above and below the observer’s level of sight. 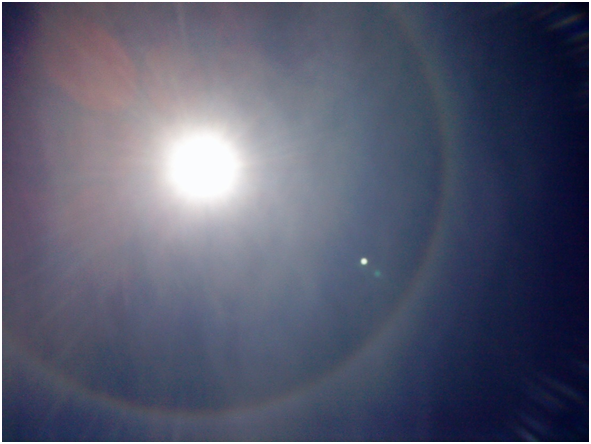 Halos appear as faint coloured rings encircling the sun. They are formed by the refraction of light through ice crystals in high-level clouds and sometimes form under relatively clear skies. Halo observed over Singapore . 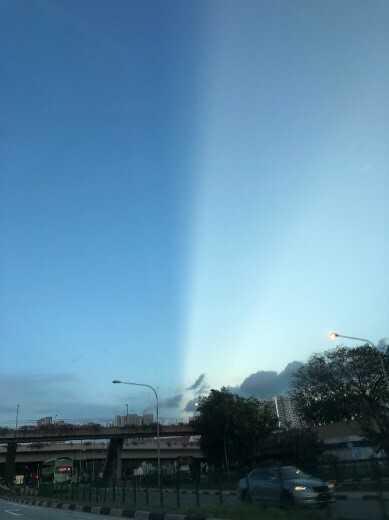 Cap cloud with pastel colours at its edges, observed over Singapore. In some cases, the crepuscular rays may extend across the sky and appear to radiate to a point on the horizon opposite the Sun. 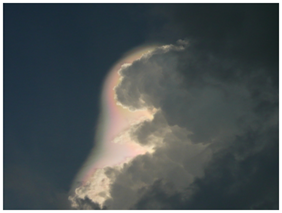 These rays are known as Anti-crepuscular rays (bottom image), and are less commonly seen than crepuscular rays. Both phenomena usually occur at sunrise or sunset, when the sun is partially obscured, and are visible because of scattering of light by small water droplets or particles in the atmosphere. While the radiating shafts of light of both optical phenomena are parallel, their appearance of converging toward or at a point is caused by perspective, the same optical illusion of looking at a long straight road or railway track converging at a point in the distance. 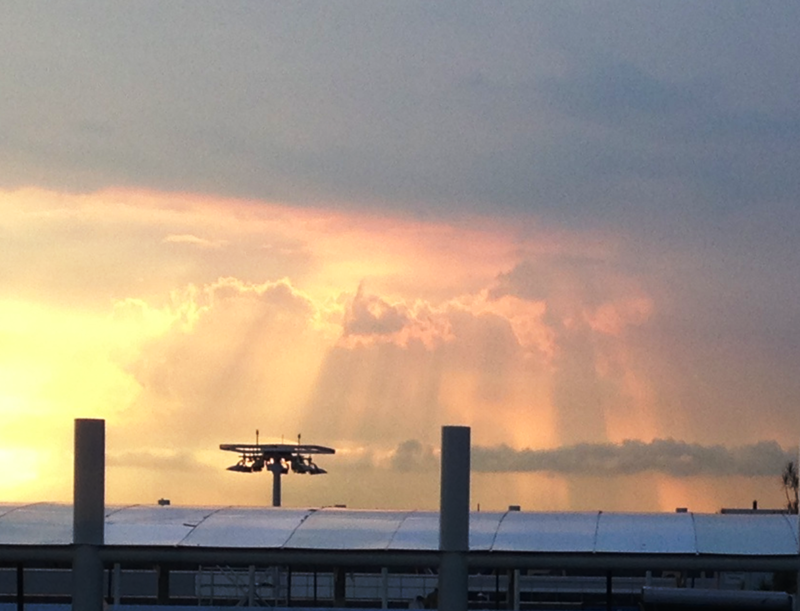 Crepuscular rays during sunset as observed over Changi.